For its always highly-anticipated limited edition Cairdeas release in 2018, Laphroaig turns to a familiar finishing treatment — the sherry barrel — with a big twist. Rather than utilize the usual oloroso barrels, or even Pedro Ximenez or amontillado casks, Laphroaig finishes this spirit in fino sherry casks. Fino is a very dry style of sherry, commonly served as an aperitif — and I don’t think to date that I’ve ever encountered it used to finish whiskey of any kind. It’s a pale expression of Laphroaig — the wine in the finishing barrel being even lighter in color than the original whisky — and its nose is redolent of dry sherry. That comprises perfumy dried florals, roasted nuts, and a heavy, dried cereal note — almost like a cracker at times. 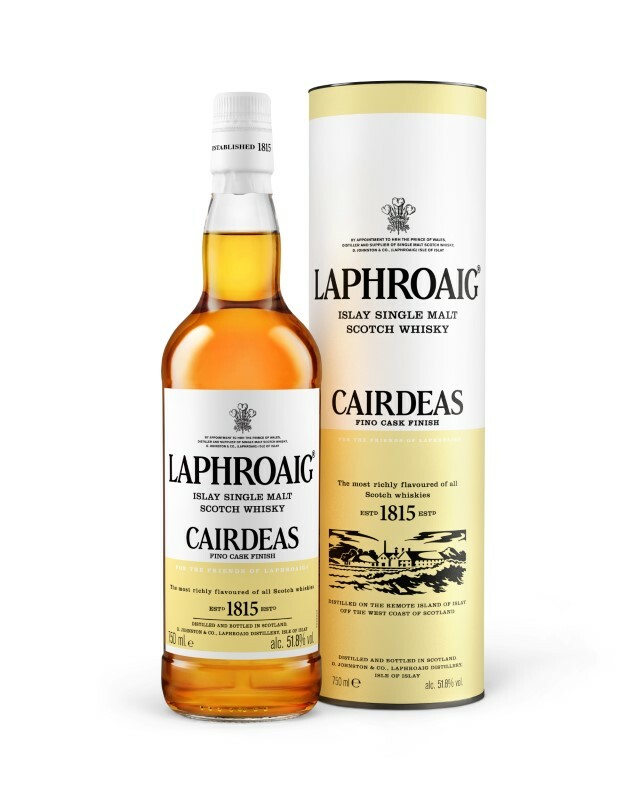 The palate continues the theme of dry sherry, offering some notes of pear and spiced nuts, but quickly taking a turn toward astringency that evokes menthol and Band-Aids, all filtered through Laphroaig’s signature smoky peat. The peat is lighter here than in many Laphroaig bottlings, and I will say that it integrates well with the delicacy of the fino sherry. But — while the finished product is plenty unique, it never manages to come across as exceptionally complex or all that earth-shaking. Still, points for originality are due here.